Hot pink/fuchsia is an easy color for me to pull off (generally speaking), so I did not hesitate to choose Pink Ruby. This is also because I presumed the new Ultra HD Lip Lacquer was a repackaged version of ColorBurst Lip Gloss, only this time with the brush applicator. I was floored to see how blindingly bright Pink Ruby is! Not only is the color itself much brighter, but also it is packed with pigment. For that, the brush applicator is spot-on. Although I personally do not think longer wands are ergonomic (which is why I prefer shorter chubbier lip gloss tubes over tall slender ones like this), but the tiny brush does work for this particular formulation. Pin Ruby is a hot pink with orchid shimmer. It is provably the brightest fuchsia I own. 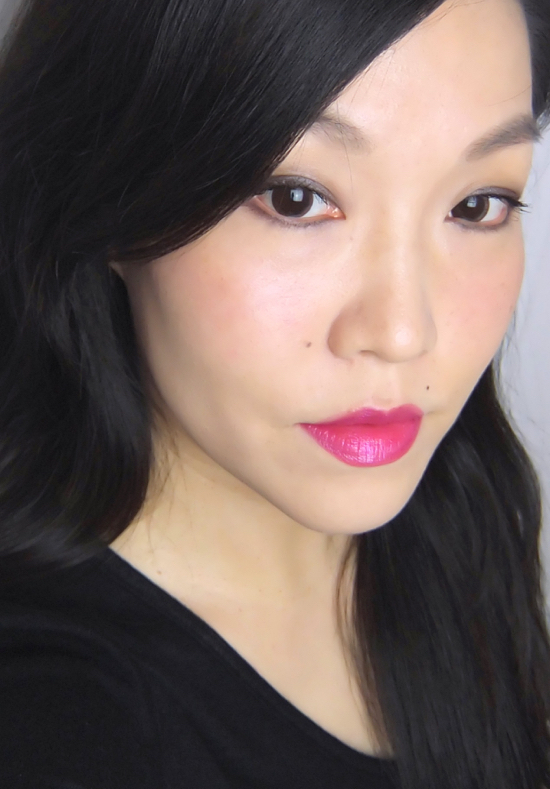 Chanel Viva and NARS Priscilla look prim compared to Pink Ruby. Very pretty and attention-grabbing it is for sure, but I can't help but think that Pink Ruby is a bit gaudy. This swatch was achieved with single swipes. The color goes on smoothly and adheres so nicely. It does not feel tacky at all. The orchid shimmer isn't much visible but it gives the bluish sheen to the finish. In the isolated pic, it might look quite pretty. However, there is no way I can wear it in full strength without feeling self-conscious. 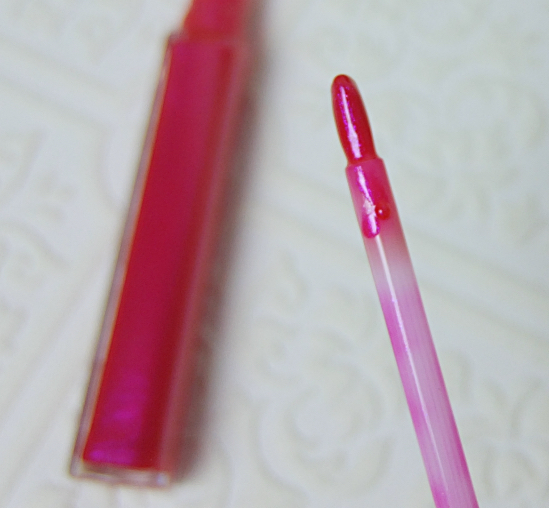 But blotted lightly, Pink Ruby instantly becomes a very flattering lip stain. So I have been wearing this as a stain. Surprisingly, the color is very very long lasting, and more importantly, it feels quite nice and comforting on lips! See? More than enough of color. 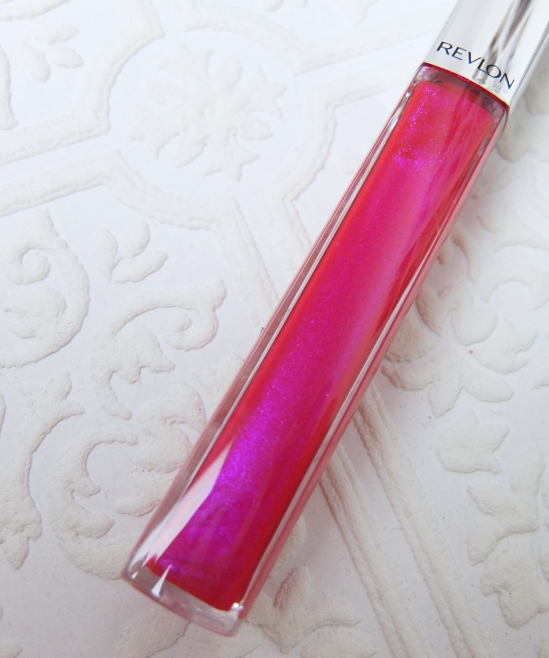 I ended up enjoying Pink Ruby thanks to the unexpected stain effect and the comfort it provides to my lips, but I do not think I'd be collecting Revlon Ultra HD Lip Lacquer. It is only because opaque full coverage lip color is not my thing. 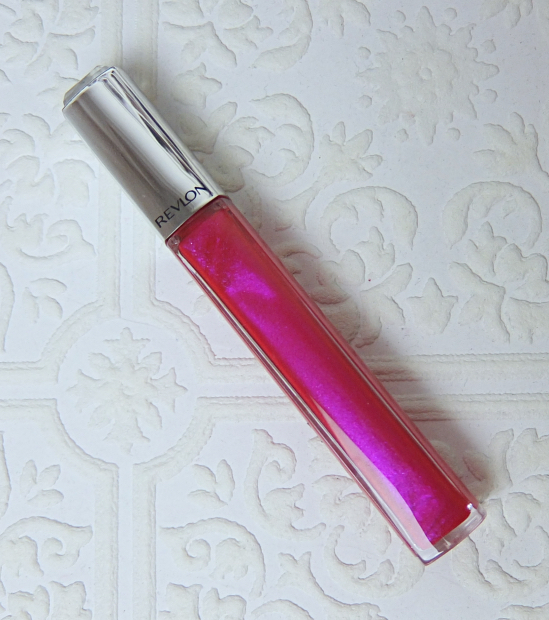 Assuming the other colors from the range are as pigmented as Pink Ruby, and if pigmented high definition color with shine is your thing, I am sure you will enjoy Revlon Ultra HD Lip Lacquer. 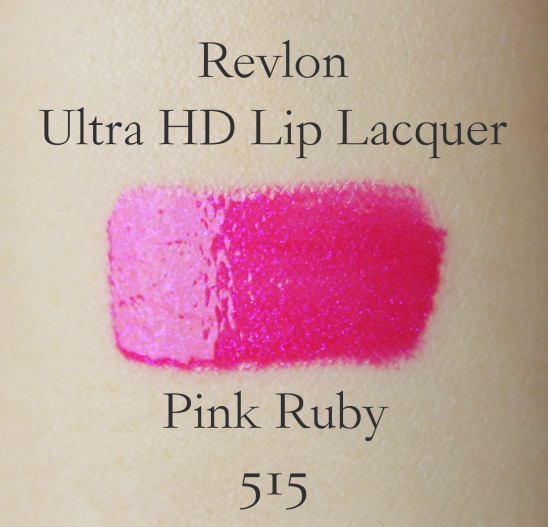 Have you tried Revlon Ultra HD Lip Lacquer? woa love how multi-dimensional it looks even in the tube! The stain looks so pretty on you! I was actually alarmed to see the shimmer and its sheen, but it just adds dimension as you said. SO SO pretty! I love it!! I love how sparkly it is! It's definitely one of the best shades from the range. Yes, indeed even after blotted off with tissue, it looks brighter than most sheer lipsticks, for example. Wowza! That is certainly an intense shade, with intense pigmentation! I would be interested in trying these, just because the shades are so saturated! such a pretty shade! I am more into lip gloss which is also a lip stain. Lip gloss doesn't last too long on my lips and I am too lazy in keep applying. I haven't tried any from this Revlon line. Will have to start hunting it down. Oh damn lady, this is EXACTLY the type of shade I've been searching for! I want this shade but in a lipstick! It's soooo gorgeous, I'm a huge fan of blue toned fuchsias! It's stunning on you and I love how glossy it is! Wow, that is bright! Holy smokes! I think you can definitely wear it full strength, though, Lena! Maybe I'd get a light shade to see if I can pull off in full strength, but not this one, Larie! Hope you're recovering well, Lily! And I trust the little Ashton is doing well, too! I actually enjoy opaque glosses, so I might like this! Thanks for the review and pics. You look lovely! Let us know what you think about them if you decide to try! Wow, they actually delivered...I totally thought it's the colorburst gloss in new packaging as well. I guess I will have to shoot for the shimmer-less ones because the color makes me self concious just looking at it. (Looks great on you though). Looks really good on you! I'm curious about the lipsticks but the glosses because not only are the shades blindingly bright but extra shiny. They look gorgeous in swatches but I don't really want to wear them myself. I agree. Super bright and super pigment plus shiny don't do well together. I wouldn't mind wearing this in matte formulation, though. I haven't tried one of these yet just because I have too many glosses as it is, but man - this is GORGEOUS! It's such a flattering color on you, Lena! And I love that it can be worn sheered out or full-on depending on your preference. The blotted version looks like something I'd feel more comfortable to wear, too! :D SO pretty! You picked such a gorgeous shade! I saw the display of these but haven't had a chance to look closely yet. I want to try something coral. Hopefully it will stain as nicely! Whoa, this is DayGlo material! I do exactly the same thing with the ultra bright and bold finishes too, but it's great to have the option of going all out if you want it to.